There are plenty of reasons why you might decide to downsize your home in Dallas. Maybe you’re older, and eager to get rid of much of the clutter of a long-lived life. Your children might have left home, and you find yourself officially an empty nester. Or you just want to live more simply, take up less space, or live in a downtown apartment with all the necessities and culture you could want within walking distance. Whatever your reasons for downsizing in the Dallas-Fort Worth area, the how of downsizing can be a pain! Let us help walk you through the process of paring down your belongings and moving in Dallas to a smaller place. Step 1. Be honest with yourself. The very first step in downsizing your home in Dallas is to take a long, honest look at all of your possessions. I know it sounds overwhelming, but just break it down and be methodical. Start with one area in your home, and look around. Is there a dusty stationary bike hanging out in your study? A stack of books you bought a year ago and never read? Are there clothes in the closet you haven’t seen for five years? You should only keep the things you regularly use, not those things you vaguely hope to use some day. It can be hard to let go, but shedding these things we don’t need can make life feel so much lighter. Look around your open spaces first, and then dive into the storage areas of each room. Go through all of your closets, the junk drawers, the cabinets, the attic, the garage, whatever you have. Separate the items you plan to keep and only put those items back into your storage spaces. For those items that you plan to sell or donate, put them aside. The rest goes in the trash. Step 2. Be honest about your space. This step builds on the work you did in going through your belongings, and may help you feel more comfortable paring down your stuff. When moving in Dallas into a smaller home, you need to be completely aware of how much space you have to work with. If you have access to your home before you move, go over and measure the rooms – or ask your realtor or leasing agent for a floor plan. Once you have measurements, you can measure your furniture and determine where everything will fit and if you need to sell that decorative piano bench or worn ottoman no one ever uses. You should also make sure to find out how much storage space you have in the new place – how extensive are the cabinets? Do you have a walk-in closet? How many other closets are there? This will let you know whether you have enough space to store that full china set or those five different winter coats you rarely use. Step 3. Get rid of it! You’ve been honest with yourself; you’ve been honest about your space. Now it’s time to get rid of all that stuff! For the items that are going straight into the trash, that’s generally a straightforward process. However, if you have large furniture items or electrical equipment (computers, vacuum cleaners), you may need to take those to a recycling facility or a specialty disposal site. 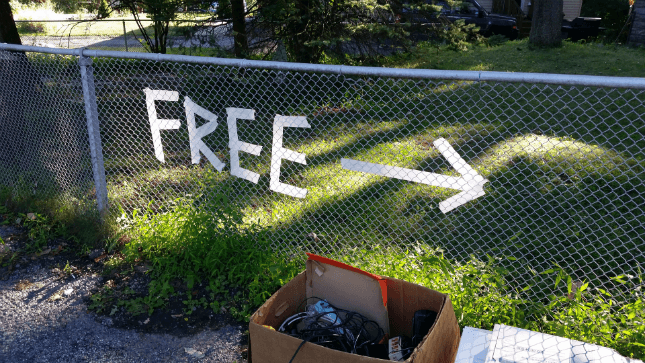 If some of those large items are still in reasonably good shape and you’re not selling them (and you’re in an apartment), check to see if the apartment has a spot designated for their residents to leave free items for others to pick up. Don’t forget to check with friends and family first to see if they want first pick! If you’re planning to sell any items before you move, try and start a few months before the big day. If you’ve got clothes to sell, try local consignment shops. You can also list stuff for sale on Craigslist, but make sure you play it safe and only meet buyers in public locations. Plan a yard sale or garage sale if you wish; just be sure to check and see if you need a license or permit first. You could also eBay items, but remember you’ll have to handle listing auctions and shipping items. After all the selling is done, donate the rest to your local Goodwill or your charity of choice (after making sure they can use what you’re donating). You may even be able to write off the donation on your taxes! Step 4. Store the rest. When you’ve purged and sold and consolidated, you may still find yourself with too much stuff to reasonably fit into your smaller home. That’s okay! Perhaps you have children at college who won’t be able to take all their belongings with them at first. Or you have extensive decorations for your favorite holidays that you only use at specific times of the year. When you’re in this situation, there’s only one thing for it: store some of your stuff. You should first check to see if your apartment comes with a storage locker or if your new home perhaps has a weatherproof shed in the backyard. If you’re lacking in on-site storage, consider renting space – at Delicate Moving, we offer containerized storage solutions in our access-controlled warehouse, so check out our storage plans if you’re researching storage solutions in the Dallas area. Just call 214-390-6714! What are you waiting for? If you need to downsize, now’s the best time to get started! You’ll feel about a million pounds lighter once you’ve done it.